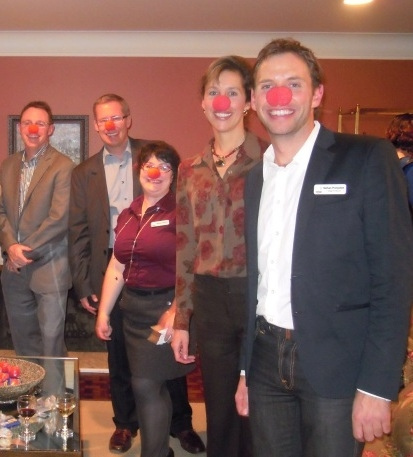 "Red noses were the required dress code at a welcome reception hosted by Consul General Laura Lochman for members of Aga-Boom Theatre of Physical Comedy and Circus Arts. The Las Vegas-based clown troop created by veterans of Cirque du Soleil is in Calgary for three days of performances for Y Stage at Vertigo Theatre, an arts group specializing in theatre for young audiences. Staff of the Consulate clowned around with guests from Calgary’s cultural community to highlight the collaborations and partnerships Y Stage has been forging with American artists specializing in theatre for young people. “Usually when we talk about our bilateral relationship, the conversation revolves around trade or security. We don’t often get the opportunity to highlight the many links between our two countries in the arts, but they are extensive,” Consul General Lochman told guests, adding that this kind of collaboration supports the development and well-being of young people on both sides of the border. The event also provided an opportunity to plug Las Vegas as a destination for family fun with guests donning colorful “flash” pins provided by Las Vegas Tourism. The evening ended with an impromptu musical performance by Aga Boom." Laura Lochman arrived in Calgary June 22 to take up her post as Consul General for Alberta, Saskatchewan and the Northwest Territories for a three-year term. Her foreign languages include French, Spanish, Portuguese and Russian. And don't mess up with her, she also holds a black belt in karate!